Self-folding microscale origami patterns are demonstrated in polymer films with control over mountain/valley assignments and fold angles using trilayers of photo-crosslinkable copolymers with a temperature-sensitive hydrogel as the middle layer. 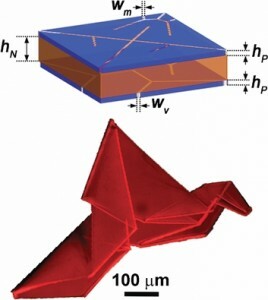 The characteristic size scale of the folds W = 30 μm and figure of merit A/ W 2 ≈ 5000, demonstrated here represent substantial advances in the fabrication of self-folding origami. See highlight in Nature Chemistry. See story in Materials Today. UMass school on "Soft Solids and Complex Fluids"
This material is based upon work supported the Department of Energy, the Keck Foundation, and the National Science Foundation under awards DMR-0846582, EFRI ODISSEI-1240441, and the Materials Research Center on Polymers.